A complete course on somatic experiencing—a revolutionary method for releasing trauma. Are you experiencing physical or emotional symptoms that no one is able to explain? If so, you may be suffering a traumatic reaction to a past event, teaches Dr. Peter A. Levine. Medical researchers have known for decades that survivors of accidents, disaster, and childhood trauma often endure life-long symptoms ranging from anxiety and depression to unexplained physical pain and harmful acting-out behaviors. As a young stress researcher at the University of California at Berkeley, Levine found that all animals, including humans, are born with a natural ability to rebound from these distressing situation. On Healing Trauma, this respected therapist and teacher brings you face to face with his effective new treatment, not a talking cure, but a deep physiological process for releasing your past traumas and instilling a harmonious awareness of your body. Drawing on nature's lessons, Dr. Levine teaches you each of the essential principles of his four-phase process. You will learn how and where you are storing unresolved distress; how to become more aware of your body's physiological responses to danger; and specific methods to free yourself from trauma. Identify the two categories of trauma-causing experiences. Explain the three innate human responses to threat. Summarize the 12 elements of renegotiation. Define the four gateways to enlightenment. According to the National Institute of Mental Health, more than 23 million Americans suffer from anxiety disorders, many as a direct result of trauma. Now you can learn how to address these and other symptoms at their source—your body—and return to the natural trauma-free state that you were meant to live in. More than six hours of instruction to free yourself from trauma through your body's built-in healing process. This program includes a 43-page study guide. I would never have believed I wouldn't have PTSD. 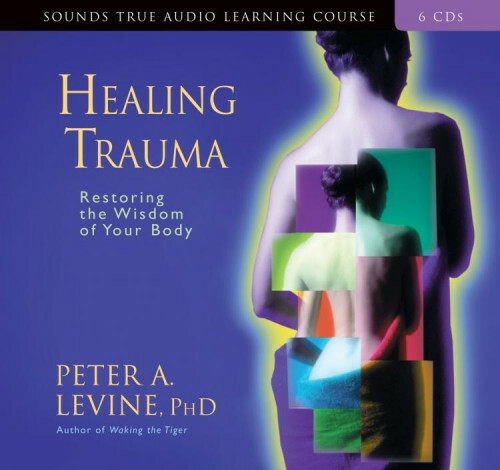 I bought Peter Levine's 6-CD set & listened to him walk me through the recovery process that took my major triggers away. What happened to me will never change, but reliving it over & over has stopped. Great course ! with clear explanations of the biology of trauma and practical steps on how to unlock it and start to experience with this possibilities. Thank you for your amazing research peter levine ! !